I have been suffering through bad day after bad day recently. I had a fender bender. My favorite football team got plowed into the turf in the playoffs. I have been suffering a great deal from weather-induced arthritis pain, low blood sugar, and viral infections. And I even reached the download limit on my WordPress account, meaning I will have to pay more money to post new pictures. But this blog is percolating along at 30 views per day or more. I am being read and exposed to the light more than I ever have in my whole writing life. That doesn’t earn me a penny, in fact, it costs me money, but it has to be a very good thing. I deal with pain and hardship through creativity. I create things to make it better. I have to believe that philosophy is essentially correct. My stories are like gingerbread. If I cook them just right, they will have that good ginger taste that soothes all hurts and longings. So, I started putting together a story in honor of her. She is already a character in several of my stories. But I needed one where Grandma Gretel was the main character. And it has to be about baking gingerbread and telling stories. In fact, I think I will bake a little magic into it. The gingerbread men she bakes will actually come to life. And I will put together a theme about overcoming the darkness with a smile and wink and a recipe for gingerbread. Beneath the old cottonwood tree there once stood a one-room school house. My mother went to school there as a girl, a short walk from home along the Iowa country road. 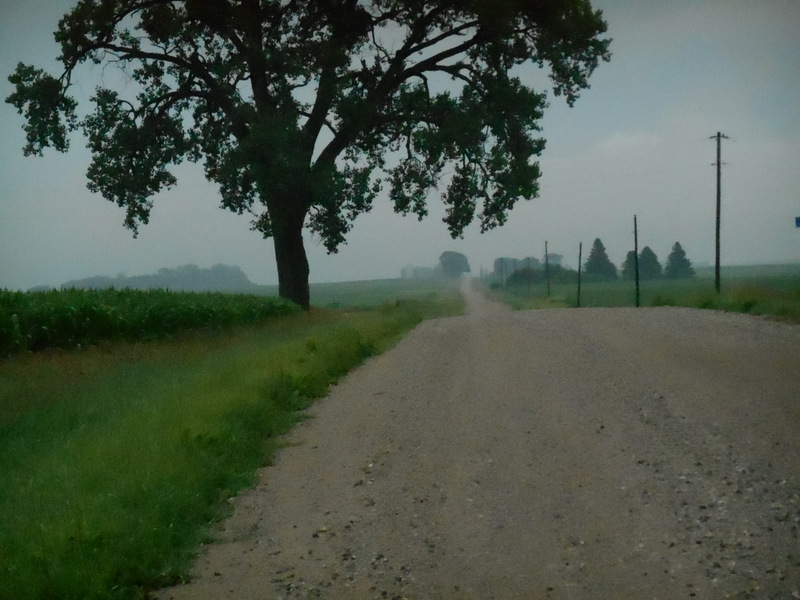 Misty mornings on a road between cornfields and soybean fields can often conjure up ghosts. I took this morning walk with the dog while I was visiting my old Iowegian home, and I was writing my fictional story Magical Miss Morgan in my head, not yet having had time to sit down and write. I was reflecting on times long past and a school long gone, though Miss Morgan’s story is really about my own teaching experience. Miss Morgan is in many ways me. But I am not a female teacher. I am a goofy old man. So, why am I writing the main character as a female? Well, the ghosts from the old school house heard that and decided to send an answer. Miss Mennenga was my third grade and fourth grade teacher from the Rowan school. The building I attended her classes in has been gone for thirty years. Miss M herself has long since passed to the other side. So when she appeared at the corner… Yes, I know… I have said countless times that I don’t believe in ghosts, but she had the same flower-patterned dress, the glasses, the large, magnified brown eyes that could look into your soul and see all your secrets, yet love you enough to not tell them to anyone else. Suddenly, I knew where the character of Miss Morgan had actually come from. I also realized why I was drawn to teaching in the first place. Teachers teach you more than just long division, lessons about the circulatory systems of frogs, and the Battle of Gettysburg… They shape your soul. I remembered the smile above all else as the lingering image faded from my view through the eyes of memory. She had a warm and loving smile. I can only hope my goofy grin didn’t scare too many kids throughout my career. I needed a post for 1000 Voices that was about reconnecting with someone. I could’ve used any number of real life examples from everything that has happened to me since poor health forced me to retire from teaching I could’ve written any number of things that would not make me feel all sad and goopy about retiring and would not make me cry at my keyboard again like I am doing now… like I did all through that silly novel I wrote… even during the funny parts. But I had to choose this. A debt had to be paid. I love you, Miss M… and I had to pay it forward. I think compassion, if it is describing something real, is not so much a quality people have as it is a behavior that they sometimes exhibit and desperately need to turn into a habit. I have learned this best, I believe, in my relationship with the family dog. Dogs do have a natural empathy and loving strength of character that you learn about when a dog owns you and decides she is willing to keep you around for giggles and kibble. 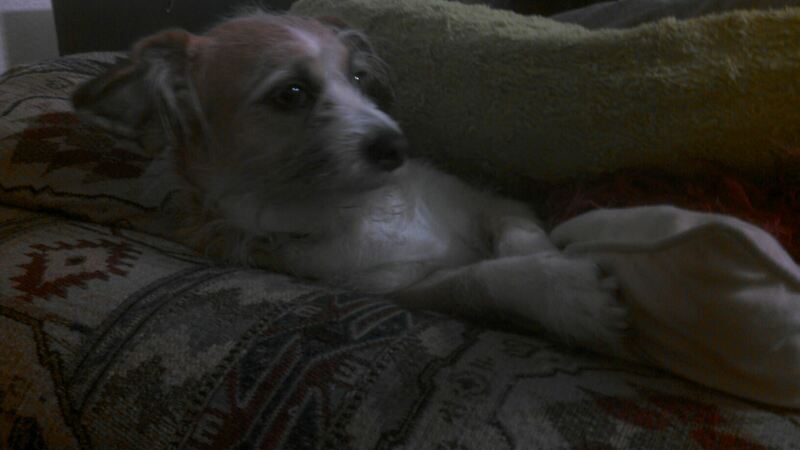 Here is Jade the dog relaxing on her couch which she is sometimes willing to share. 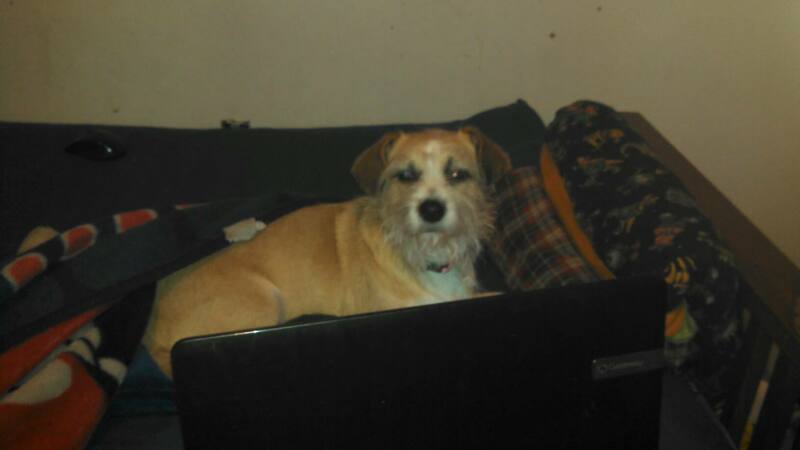 This dog came to us in the late evening one spring night. We were coming home from religious services, and we had to stop the van because there was a puppy directly in the road ahead. She just showed up in the headlights, all big head and big belly, not really capable of taking care of herself, or even keeping herself from getting run over by the very next car that came along. She couldn’t have been more than a month old, still a little unsteady when she walked. She had a collar and a name tag, along with shot tags. We figured someone had accidentally let her get out of the house to wander and probably wanted her back. Well, we were wrong. The animal shelter was willing to take her, but that meant the risk that, if no one claimed her, she would be euthanized with all the other strays. She was too cute and instantly-attached-to-us to run the risk of that happening. The name and vet tags gave us no leads. We didn’t have the names of either owners or the vet who gave her the shots. She had become ours by default. I now suspect that she got out of her cage at the nearby Petco and the employees who lost her immediately wrote her off as deceased. No employee ever came looking, and, of course, when asked no one knew anything about it. 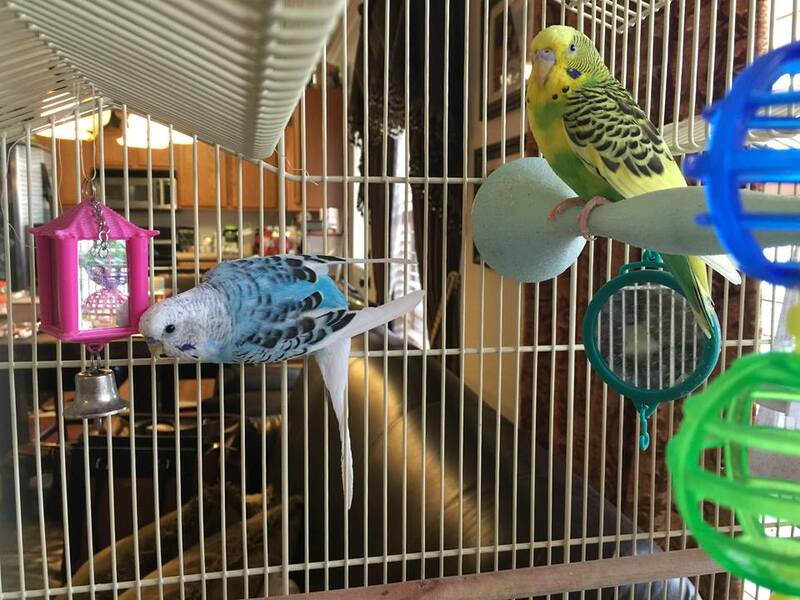 These aren’t actually our parakeets. Ours are all deceased. The next winter, the dog killed all our parakeets. It’s not what you think. She didn’t eat them or anything. But wintering in the garage because of Mom’s reaction to new carpet patterns was something the dog really didn’t like. So she scratched her way to freedom through the garage door. And she chose a bitter cold January day to do it. So, the birds froze to death. The dog, in her fur coat and newly free of the garage prison, was insanely happy. So you have to learn to make sacrifices to be owned by a dog. But there are benefits, too. I am a grumpy old man now with numerous health problems. But the dog gets me out three or four times a day to exercise me. She pulls me along by her chain all around the park and exercises my lower back by making me constantly bend over and pick up poop. I have become an expert at working through the pain to swoop up poop in an old donut bag or Walmart sack. Did I ever tell you what an amazing pooper that dog is? Five times every day! Six if I take her out five times! She seems to be capable of producing triple her own weight in poop every day. I would’ve wondered how she managed so much more output than she had input, until I started noticing what things were missing from the pantry and what wrappers were stuck behind the couch. 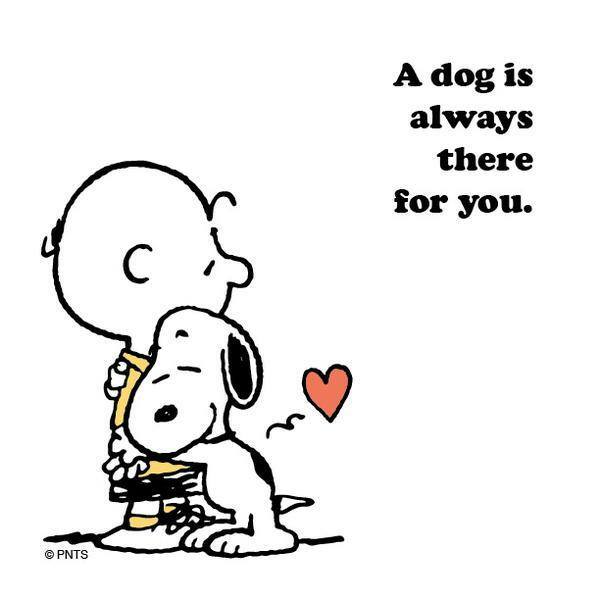 And a dog loves you no matter what. I am the first person to feed her when we brought her into our house. so she obviously believes I am her mother. I get grumpy and cuff her on the ears for biting my fingers when I try to pet her, and she still wants to be petted (and be able to bite me) even more. I swear at her when we are walking, and she just grins at me. She believes dammitdog! is her second name. And if she doesn’t get to sleep in somebody’s bed at night she whines. That doggy bed we got for her is apparently only to be used for dragging over the top of the latest poop or pee stain. So, being owned by a dog teaches you compassion by making you practice it every single day. 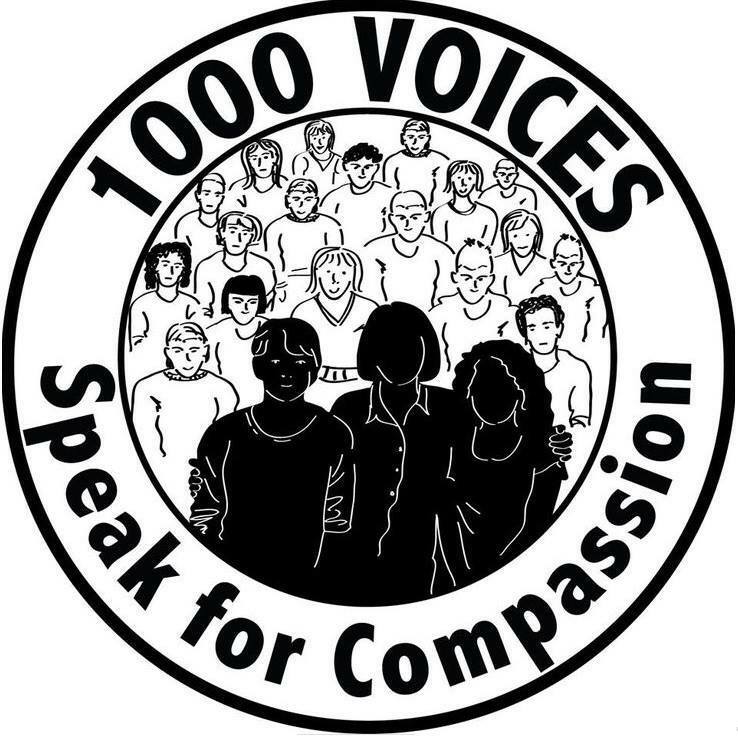 When I was contemplating what this post for 1000 Voices for Compassion was going to say, I read this insightful post by Melissa Firman; When the Bully is the Teacher. It tore a few more holes in my soul. You see, I was a teacher. And I was not the safe, self-satisfied, sit-behind-the-desk-and-pontificate sort of teacher. I was the walk-up-and-down-the-aisles-between-the-student-desks teacher. I was the look-over-your-shoulder-and-care-what-you-are-learning teacher. I took the risks necessary to connect with kids and find out what was really happening in students’ lives. I was definitely aware of teachers who belittled their charges and used negative comments and punishments to motivate them. I did what I could to steer those teachers in another direction. I was involved in campus improvement teams. I provided in-service training to my fellow teachers on methods and implementation and best practices. I was a department head for middle school English for a decade. I tried very hard to get other teachers to love kids too. But I learned very early on that for every hard-won, consistently-practiced teacher super-power that I developed there was an even more powerful bit of Kryptonite lurking somewhere. Bullying broke my heart my second year as a teacher. I didn’t understand. I thought teachers were heroes. Teachers are supposed to be able to solve problems like this. Of course, I was just a second-year teacher at the time. Maybe there was something I hadn’t learned yet. It was not going to be beyond my power forever… but it was. Ruben solved his problem the following year. At the time the Bloods from L.A. hadn’t moved into San Antonio yet to become the San Antonio Kings. The Crips hadn’t moved into San Antonio and become the Ffolks. There was only a gang on the South Side called the Town Freaks. Ruben moved back to San Antonio and became a Town Freak. Nobody was going to mess with him ever again. One night they stole a pickup truck and went for a joyride. Ruben was riding in the back. When the police chased them, the truck overturned. Six Town Freaks were killed. Ruben was one of them. Nobody was ever going to mess with him again. What does this have to do with compassion? It tore my heart out. I can’t write this post, even thirty-three-years after it happened, without tears blurring my eyesight and sobs wiggling my laptop. 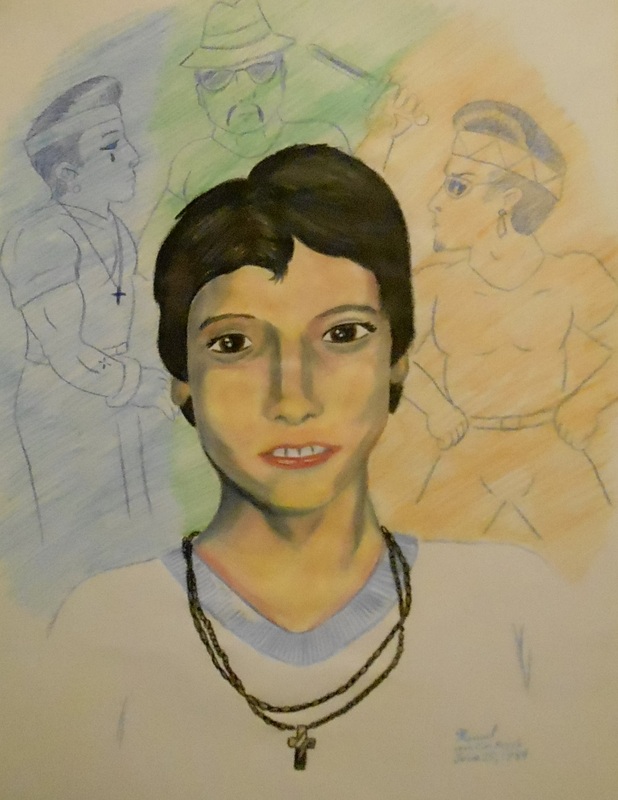 I still believe that if only we could’ve found a little more compassion in our hearts for Ruben Vela… if only more adults would’ve honestly tried to see things through Ruben’s eyes… well… you know. I never use the real names of students in posts. They have a right to their own stories. They need to have their privacy respected. Ruben Vela is different. Somebody needs to remember that boy’s name whenever we pass off bullying as inevitable, as a part of our culture, as normal. I have never forgotten. Remembering what happened to Ruben made me more aware for the rest of my teaching career. It will affect me for the rest of my life.